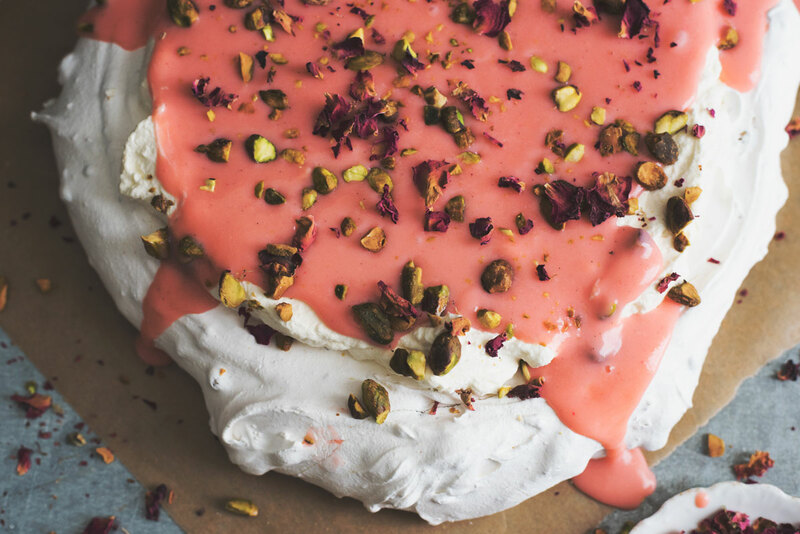 A gorgeous and delicious recipe for pistachio pavlova with rhubarb curd. Make it a day in advance and only have 5 minutes of assembly time before serving! All rhubarb all the time has been my motto this Spring. I’m not the only one. It seems like everyone I’ve talked to lately has been on the hunt for rhubarb! It makes me miss my time in the midwest, where rhubarb was found in abundance this time of year. People brought it by the armful to work, and my mother-in-law had a particularly robust patch. 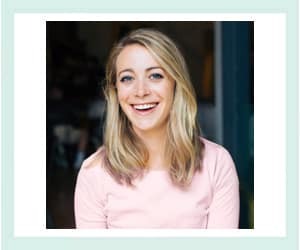 Sort of like our lemon situation here in San Francisco. Luckily, I found rhubarb at the Ferry Building Farmer’s Market this year. 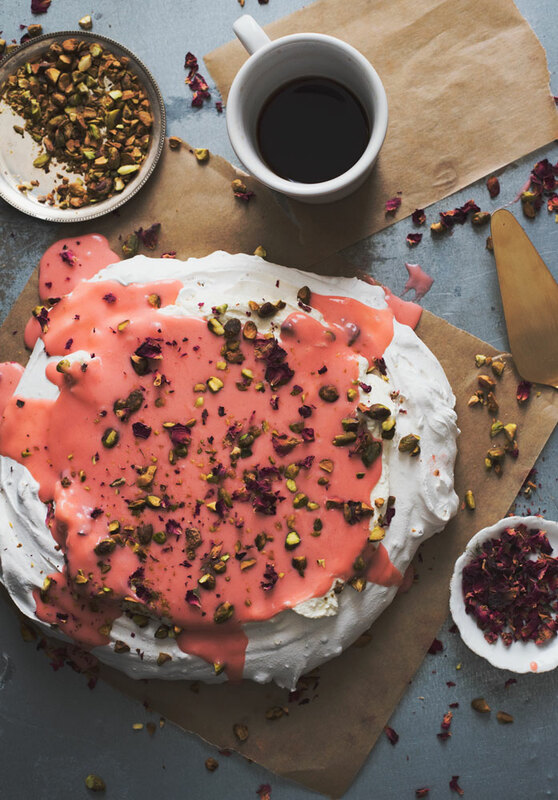 Thank goodness, because I’ve had rhubarb pavlova on the brain for some time. 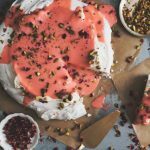 I’ve made pavlova before, but this version has pistachios nestled in the layers of baked meringue. It’s quite spectacular really and pairs well with the tart rhubarb. A few notes about the recipe. In order to get this pretty pink rhubarb curd, you’ll need to find the deepest red, most vibrant rhubarb around. The green stuff, combined with eggs makes a yellowish color which is still delicious but not as photogenic. I learned this the hard way. Worst case scenario, this is something a little gel food coloring can rectify, and your dinner companions will be none the wiser. 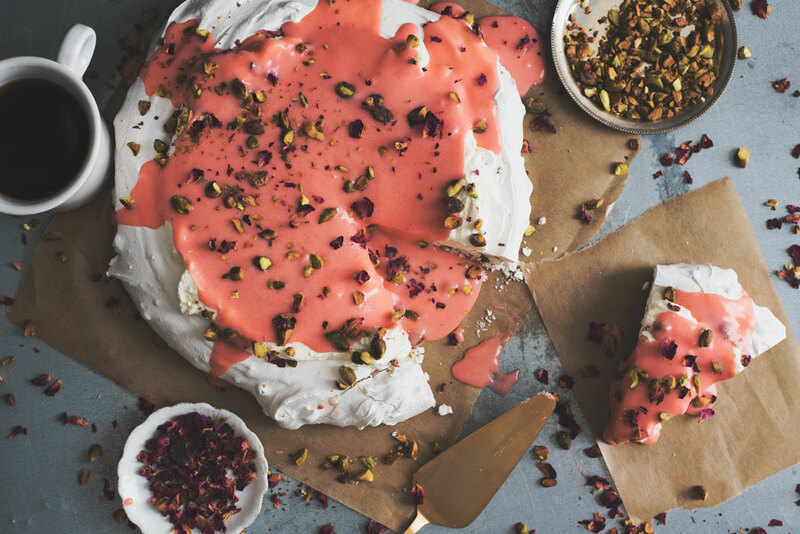 You can make the pavlova and the rhubarb curd a day or two in advance. This makes a day of assembly a breeze (5 minutes! 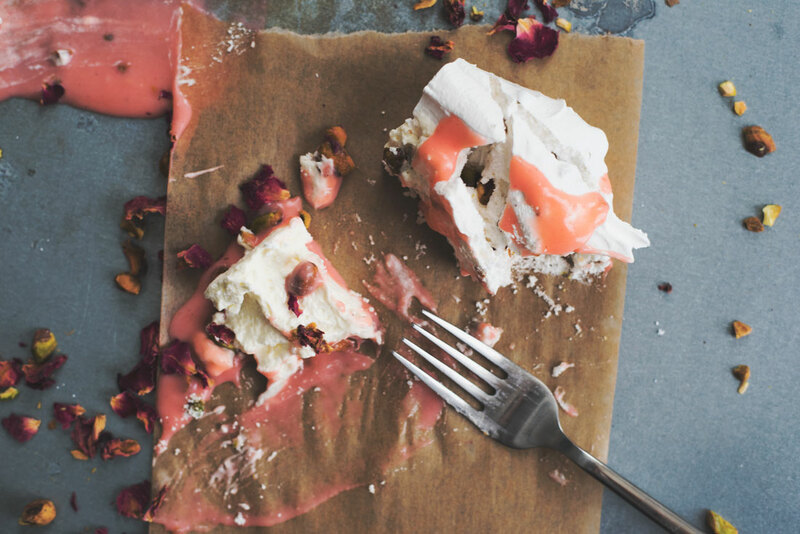 ), meaning more time with your guests and less cleanup after dessert. You could even chop the pistachios in advance to cut it down to 3 minutes. In a small bowl, toss the pistachios and cornstarch. In the bowl of a stand mixer fitted with the whisk attachment, beat the egg whites and salt on high until foamy, 2 minutes. Beat in the vinegar. Beat in the sugar 1 tablespoon at a time. Once incorporated, continue beating until the whites are glossy and stiff peaks form, 8-10 minutes. Fold in the pistachio mixture. 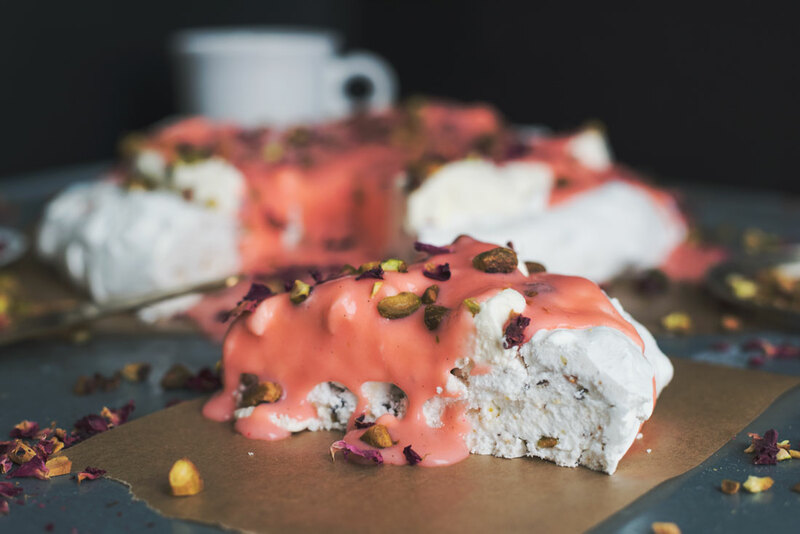 Spoon the meringue onto a baking sheet covered with parchment paper. Spread into a 10-inch round and use the back of the spoon to make a slight indentation in the center. Lower the preheated oven to 225° F and bake for 1 1/2 hours. 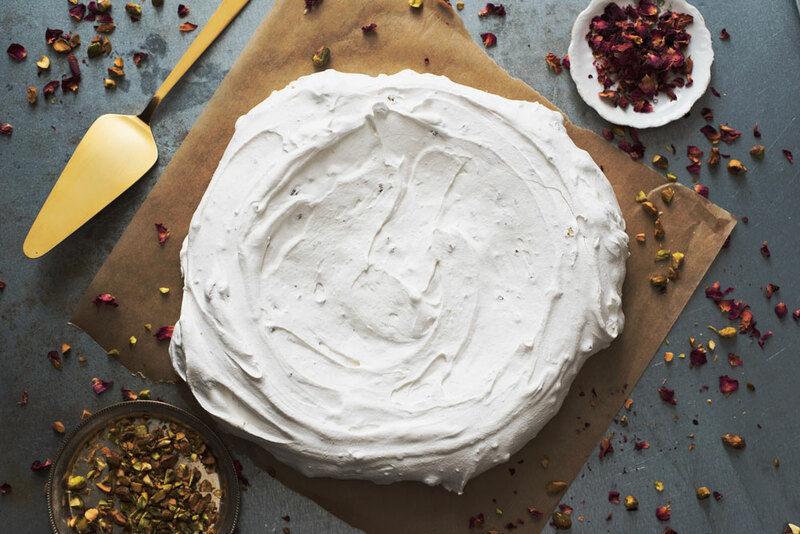 Turn the oven off and, without opening, let the meringue rest in the oven for 1 hour. Transfer to a rack and let cool. Will keep in an airtight container or bag overnight. Place the rhubarb, 1/4 cup superfine sugar, water, and rose water extract in a saucepan. Cover and cook over low heat, stirring occasionally, for 10 minutes or until rhubarb is completely softened. Blend with a hand mixer. Place an inch of water in a medium saucepan and bring to a boil. Place the rhubarb mixture in a heatproof bowl. Add the egg yolks, butter, lemon juice and remaining 1/2 cup of sugar and whisk to combine. Place the bowl over simmering water and cook for 5 minutes, until mixture is smooth and thick. Set aside to cool to room temperature, before serving. Will also keep in the fridge, covered with plastic wrap, for 2-3 days prior to use. Note: Rhubarb curd in the photos is a slightly different version from the recipe above. I had the nagging feeling that I could do better than the first version so I went back to the kitchen and figured out a different method! This version is similar in color but with a thicker texture due to the pureed rhubarb. I promise the switch was worth it! 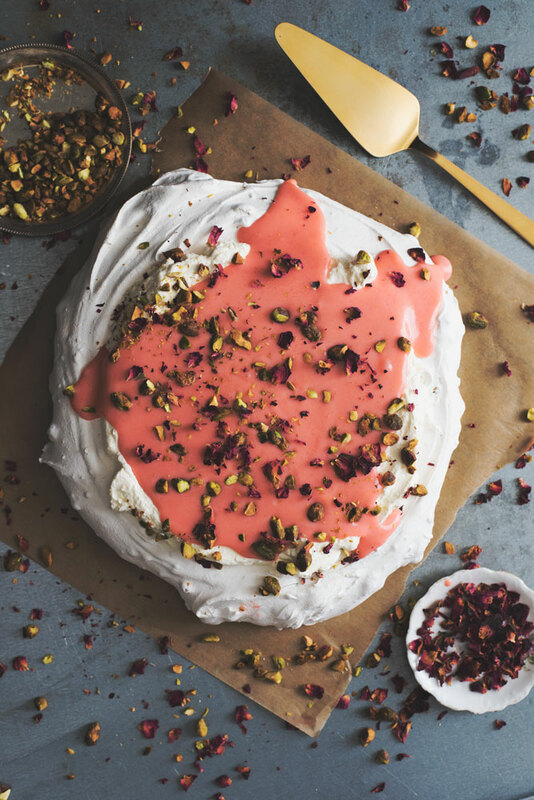 This is so beautiful and I love your addition of pistachios and rose petals to garnish that rhubarb curd, it looks so perfect!